Bulk SMS Malaysia | Personalised Message - lowest price & most reliable Bulk SMS marketing tool, 2 way sms Malaysia, works with Bulk SMS Singapore, online sms solution, web sms marketing. Being able to personalise the message is a very important feature when you want to send marketing text messages. Bulk SMS Malaysia is capable to merge certain data fields of your customer's details into the message. In a way, making your customer's feel privillaged. 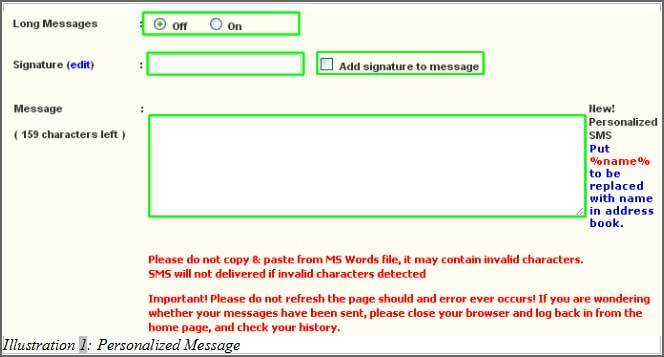 You are able to write customised messages on your own and blast out the sms, as shown below. Sub account users are able to do so as well unless the main account holder (you) did not allow the message control for sub-accounts. Below is the personalised message panel, where you can choose either to compose a long message or normal text message with characters limit. You are also able to add in message signature but 13 characters will be deducted for normal text messages.